In a series of Twitter updates, Augusto C�rdenas of Diario Panorama, a newspaper based in Venezuela, provides some highlights of a story he did on Marco Scutaro’s situation. Scutaro informed Cardenas that his preferred landing spots this offseason are the Dodgers and the Red Sox, considering that would give him the best shot at making the postseason. The Dodgers have expressed interest in Scutaro as a second baseman, while the Red Sox have an obvious need at shortstop. Rangers and Mariners have contacted Scutaro as well. Some teams have also asked about Scutaro as a third baseman. Scutaro hasn’t closed the door completely on returning to the Blue Jays, though that is highly unlikely. Toronto will offer him arbitration to make sure the club is in line to net two compensatory Draft picks if he declines and signs elsewhere. Scutaro would like a multi-year contract and he is in a position to get one. With few top-tier shortstop options out there, Boston’s best bet figures to be Scutaro, who is coming off a career year. Under the circumstances and in this market, Scutaro might even be able to wind up with a three-year contract. The Blue Jays are content with heading into 2010 with Alex Gonzalez and John McDonald as their shortstops. That being said, if Scutaro decides to accept arbitration — I wouldn’t bet on that happening — Toronto is said to be ready to take on all three players. HALLADAY UPDATE: I’m sure you have all heard by now that Jays ace Roy Halladay would reportedly be willing to waive his no-trade clause to be traded to the Yankees. 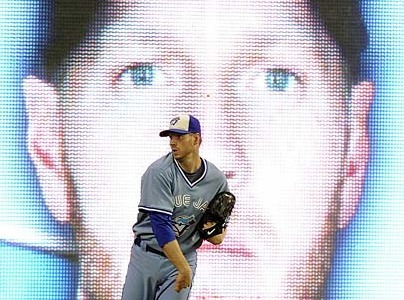 At this point, it’s safe to assume that the Blue Jays would not be in serious talks with any teams that Halladay would not approve. Given his place in the organization, there’s no way Toronto has NOT asked Doc what teams he would and would not want to play for. So, with GM Alex Anthopoulos acknowledging that he’s willing to trade players within the AL East, and Halladay’s desire to win, it’s fair to assume he’d approve a deal to the Yankees or Red Sox. Blue Jays GM Alex Anthopoulos said on Wednesday night that he was still searching for a starting shortstop. On Thursday, Toronto announced that it had signed shortstop Alex Gonzalez to a one-year contract with a club option for the 2011 season. He will earn $2.75 million in 2010 and could make another $2.5 million the following year. Gonzalez gives the Jays a second defensive-minded shortstop, along with veteran John McDonald, who signed a two-year deal worth $3 million on Wednesday. Strong “D” at the position will be important in helping make up for having Edwin Encarnacion in place as the starting third baseman. Gonzalez hit .238 between stints with the Reds and Red Sox last season, but did hit .284 with five homers over 148 at-bats after being traded to Boston in August. If Gonzalez exceeds expectations on offense, Toronto may have an option for 2011 or at least a potential trade chip. If he underforms, the Jays only took a one-year risk. Another plus for the Jays — a team in transition looking to strengthen its foundation — is the fact that Gonzalez is not a Type A or B free agent. Signing him will not cost Toronto any picks in the 2010 Draft. Adding Gonzalez makes it extremely unlikely that the Jays will re-sign Marco Scutaro (Type A). Despite re-signing veteran shortstop John McDonald to a two-year contract on Wednesday, the Blue Jays are still actively searching for a starter at the position. Jays GM Alex Anthopoulos said McDonald’s role is “undefined” heading into the season. Toronto has a free agent in shortstop Marco Scutaro, but Anthopoulos noted that talks with him have “stalled more than anything.” If the Jays do retain Scutaro, it would likely have to be with a one-year deal, according to the GM. That one-year deal likely means the Jays are only going to offer Scutaro arbitration. Since Scutaro is a Type A free agent, the Blue Jays would receive two compensatory picks in the 2010 First-Year Player Draft if the shortstop declines the one-year arbitration offer and signs with a new team. Gaining Draft picks is tempting for a Toronto club that is in transition and looking to strengthen its farm system. Anthopoulos added that he is still searching for a long-term solution at short, but the 2010 starter at the position will likely be via a short-term signing through free agency. 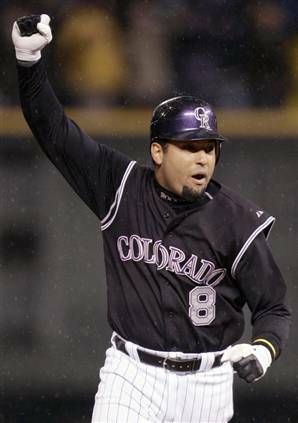 Two options would be Miguel Tejada and Orlando Cabrera, who are both Type A free agents. Cabrera could fill the leadoff role vacated by Scutaro as well. 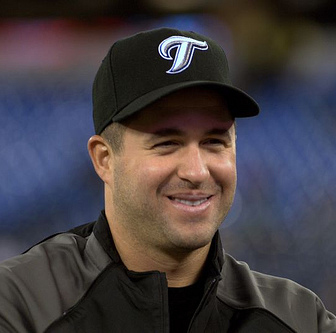 The Blue Jays have re-signed John McDonald to a two-year contract worth $3 million. This will keep Johnny Mac in the fold through the 2011 season, giving Toronto some depth around the infield. This isn’t necessarily a great signing, but it’s not a bad one, either. The Jays are a team in transition, without a stud shortstop in the system, so a short-term solution is the best one right now. If the Blue Jays grab a shortstop prospect in a possible Roy Halladay trade, McDonald would serve as a valuable mentor. He’s one of the best defensive infielders in the game. If Toronto signs or trades for a starting shortstop, McDonald provides a solid backup. The Jays also have a free-agent shortstop in Marco Scutaro, but he is a Type A free agent — something Toronto did not anticipate happening when they traded for him a few winters ago. Scutaro will require a multi-year deal and has a suitor in the Red Sox, among others. The Jays might be content with taking the two compensatory Draft picks rather than re-signing him. Does more McDonald on a regular basis hurt the offense? It might. He’s a career .238 hitter. That being said, the Blue Jays are looking at another fourth place finish in the American League East in 2010. The playoffs are more of a long-term goal at this point, so the Jays need a short-term solution until they find their shortstop of the future. In need of help behind the plate, the Blue Jays have inquired about free-agent catcher Yorvit Torrealba multiple times and are expected to make a formal contract offer, according to an industry source. Torrealba’s agent, Melvin Roman, confirmed on Tuesday that Toronto has reached out to him on more than one occasion to discuss the catcher’s future, but he declined further comment. Beyond the Blue Jays, Torreabla has suitors in the Rockies and Giants, with two or three other teams expressing some level of interest. Rod Barajas, who served as Toronto’s primary catcher over the last two seasons, is a free agent this winter, leaving a vacancy behind the plate for the Jays. The only catcher with big league experience currently on the Jays’ roster is Raul Chavez, who is eligible for arbitration this winter and is expected to return as the backup. Blue Jays GM Alex Anthopoulos has maintained that he would like to keep Halladay, is reluctant to trade the right-hander and that he is not actively shopping any of his players. This latest development seems to indicate more than ever that Anthopoulos is keeping an open mind, to say the least. As for the chance that Halladay ends up in Cubbie blue? Muskat writes that the Cubs can’t afford to take on the $15.75 million salary Halladay is due to make in 2010 and adds that Toronto was asking for some of Chicago’s top prospects. That combination makes a possible deal with the Jays unlikely at this point. When reached on Friday night, Anthopoulos declined to comment on the report. 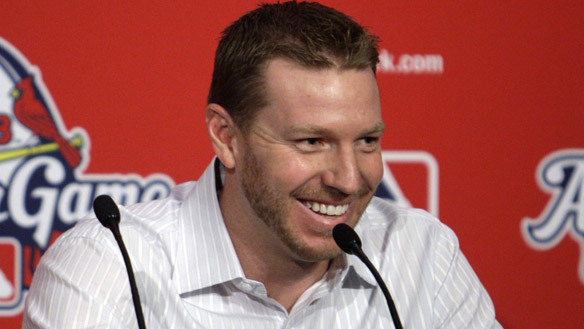 The leading contenders to land Halladay appear to be the Yankees, Red Sox, Dodgers and Phillies. There are a few items to address here on the blog today. First off, congrats are in order for Aaron Hill and Adam Lind, who were well-deserving recipients of Silver Slugger Awards on Thursday night. As a duo, Hill and Lind became only the second Jays teammates in team history to finish with at least 35 homers, 35 doubles and 100 RBIs in the same season. The 222 combined RBIs for the pair were the most in a season by a Toronto duo since ’03. It marked only the third time in Blue Jays history that two players from Toronto received Silver Sluggers in the same season. Other winners from the AL included Yankees first baseman Mark Teixeira, Rays third baseman Evan Longoria, Yankees shortstop Derek Jeter, Twins catcher Joe Mauer and outfielders Torii Hunter of the Angels, Ichiro Suzuki of the Mariners and Jason Bay of the Red Sox. Center fielder Vernon Wells underwent surgery to repair cartilage damage inhis left wrist on Thursday in Scottsdale, Ariz., where Dr. Donald Sheridan performed the operation. A team official said the procedure went as planned and Wells is expected to be recovered and ready for Spring Training. Here is the list of Blue Jays’ players who are eligible for arbitration with service time and 2009 salary in parentheses: RHP Jeremy Accardo (3.171/$900K), INF/OF Jose Bautista (4.165/$2.4 million), RHP Shawn Camp (4.170/$750K), C Raul Chavez (5.074/$500K), RHP Jason Frasor (5.134/$1.45 million), RHP Casey Janssen (3.063/$413,900), RHP Brandon League (3.145/$640K), RHP Shaun Marcum (3.128/$405,200), RHP Dustin McGowan (3.113/$419,400), LHP Brian Tallet (4.146/$1.015 million). I have a feeling this is going to be a recurring post here at MLBastian throughout this offseason. With a weak pitching market, and the Jays in a transition period, ace Roy Halladay will have plenty of suitors. Monday marked Day 1 of the GM Meetings in Chicago — the Winter Meetings’ little brother. There is no shortage of rumors and reports and a handful out right now deal with Doc. You probably won’t be seeing many quotes from rookie GM Alex Anthopoulos. He’s trying to keep quiet when it comes to rumors and reports — a different approach than former Jays GM J.P. Ricciardi. That won’t stop the speculation, or halt other sources from offering up some information. 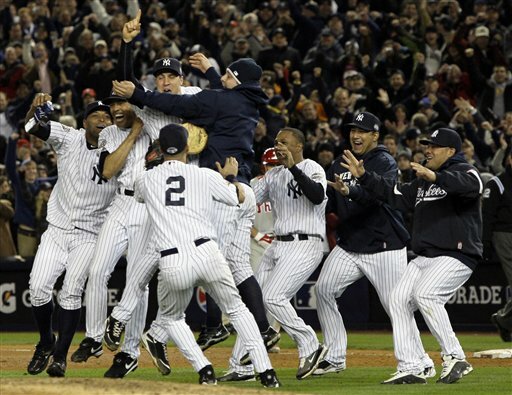 First off, congratulations to the New York Yankees on becoming the 2009 World Series champions (and for making me look smart by coming through on my prediction of them earning baseball’s biggest crown in six games). That was a great Fall Classic. Cliff Lee’s mastery in Game 1. Chase Utley’s power surge, tying Reggie Jackson’s 1977 mark of five World Series homers. Johnny Damon pulling off a solo double steal to ignite a late rally and help the Yankees take a critical Game 4. Godzilla going off for six RBIs in the clincher in the Bronx. Now, it’s officially the offseason. With the baseball season in the books, it’s time to look ahead. In 15 days, teams can begin offering contracts to any free agent they choose. Until then, teams have an exclusive negotiating window with their own free agents. For your Toronto Blue Jays, they list of free agents include catcher Rod Barajas, shortstop Marco Scutaro, shortstop John McDonald, first baseman Kevin Millar and catcher Michael Barrett. Millar will not be back in 2010 and it’s a safe assumption that Barrett will also follow him to the open market. Jays general manager Alex Anthopoulos has maintained that the team has interest in retaining Barajas, Scutaro and McDonald. Will Toronto bring all three back? My educated guess is no. A lot depends on what direction the Jays take this year, and Anthopoulos will likely shed light on that this weekend. Scutaro is coming off a career year and is eligible as a Type A free agent — something the Jays did not count on. That means Toronto would receive a pair of compensation picks if he signs with another club. Barajas is a Type B free agent, meaning the Jays would receive one sandwich compensation pick if he signs elsewhere. As for McDonald, he rarely saw action in 2009 until the end of the year, when Scutaro was sidelined with a foot issue. It made sense to keep McDonald on the bench — given the season’s turned in by Scutaro and second baseman Aaron Hill — but he might want to see if there is a team out there willing to offer more playing time. There are a number of other issues still unsettled — the future of ace Roy Halladay being front and center in the direction of the Blue Jays. Toronto will also likely be looking to upgrade its offense this winter and some rotation and bullpen help might not be a bad idea, either. It all depends on how much cash the Jays decide to spend. I’ve been told that the Blue Jays will have eyes on veteran lefty John Halama for his next start for Aguilas Cibaenas in the Dominican Republic winter league. Jays GM Alex Anthopoulos could not be reached for comment. Halama, 37, spent last season with Triple-A Gwinnett in the Braves’ system, going 4-7 with a 4.48 ERA in 16 games (13 starts). Halama has not pitched in the Majors since 2006 and split his time as a starter and a reliever over nine big-league seasons. Beyond the Jays, Halama’s agent, Joe Rosario, indicated that the Cubs, Brewers and Braves have all talked to him about the pitcher. It’s not clear what level of interest Toronto has right now, but I’m assuming it would be more for bullpen depth at the Minor League level than anything else. So far this winter in the Dominican, Halama has been sharp, posting a 2.00 ERA over three starts with a 0.89 WHIP across 18 innings of work. A bit of trivia: Halama was a part of the blockbuster trade that sent lefty Randy Johnson from the Seattle Martiners to the Houston Astros in 1998.